IF YORKSHIRE’s performance in the first session of this match had been an English essay, it would have been returned with a red line through it and the words: “Must do better”. After choosing to bowl beneath overcast skies, they conceded 132 runs in 29.3 overs, with exactly 100 of those runs coming in boundaries. That they took three wickets in the process seemed neither here nor there. Yorkshire were below-par, and the lunchtime score of 132-3 actually flattered them. Not for nothing, however, are Andrew Gale’s men back-to-back champions. Even the best have their difficult periods, their sticky patches, and Yorkshire hit back in the manner that champion sides invariably do. Five wickets fell in the second session as Notts tumbled to 238-8 at tea, and the home side were eventually dismissed for 261 before bad light claimed the last 24 overs. Considering that Notts had been 77-0 after 15 overs, which would have been a creditable start in a 50-over match, the day turned out a darn sight better for Yorkshire than had earlier seemed likely. Fourteen players in this fixture have international experience (seven on each side), so it was ironic – and not a little pleasing – that two men who have not represented their country shone the brightest on a miserably cold day. Jack Brooks took 4-74 from 16 overs, recovering well after Gale had hauled him off after his first two overs with the new ball disappeared for 20, and Steven Mullaney top-scored for Notts with 78. 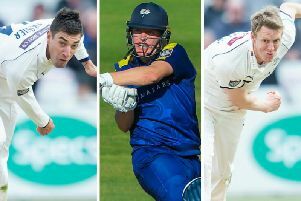 Brooks and Mullaney may lack the box-office appeal of such as Joe Root and Jonny Bairstow, Alex Hales and Stuart Broad, but their value cannot be doubted. For the umpteenth time, pace bowler Brooks proved his priceless knack for taking wickets after a hitherto quiet start to the season, while opening batsman Mullaney went close to what would have been his third hundred in just four first-class appearances this year. After draws with Hampshire and Warwickshire in their opening two games, Yorkshire handed a debut to David Willey and welcomed back Root for his first Championship appearance in more than 19 months at the expense of Jack Leaning. Willey took the new-ball from the Pavilion End, but it was Mullaney and Hales who immediately stamped their authority on proceedings. Mullaney struck three of Brooks’s first five balls to the rope, and Willey struggled to make an impact after replacing the injured Ryan Sidebottom. Even Steve Patterson was not his usual parsimonious self, the openers raising the fifty stand from 63 balls – Mullaney bringing up the landmark with a pulled six off Brooks. Mullaney then dished out the same treatment to Liam Plunkett before Brooks took the first wicket with the first ball of his second spell. Hales, having played nicely hitting eight boundaries, misjudged a full-length ball which he drove to Root at short-cover. In many ways, the innings was typical Hales – some great stuff and some not so great stuff, and it provided little conclusive evidence that he remains the best option as Alastair Cook’s opening partner at Test level. Brooks pounced again when Greg Smith dragged on a wide delivery that took out the middle stump, departing for a 12th-ball duck to leave Notts 89-2. The session overwhelmingly belonged to Notts, but they lost a third wicket in the final over before lunch when Patterson snared Mullaney. He probably did not have to play at the ball which he edged to first slip, where Alex Lees did well to grab the chance at the second attempt. Yorkshire bowled a much tighter line after lunch and were rewarded when Riki Wessels drove airily at Plunkett and was smartly caught by Root at second slip. Notts slipped to 195-5 when Adil Rashid pinned Samit Patel, and to 201-6 when Brooks trapped former Yorkshire batsman Michael Lumb on 49. Brooks turned round Chris Read with a delivery that he edged to wicketkeeper Jonny Bairstow, and Rashid put the seal on a fine afternoon session when Jake Ball top-edged a sweep to Brooks at a deep-ish square-leg. Rashid claimed his third wicket when Jackson Bird was lbw to the fourth ball after tea, and Brooks rounded things off when he ran out Broad after the England all-rounder had thumped 36 from 34 balls, including seven fours. With the floodlights on and Sky TV covering the game, the contest would surely have restarted if at all possible, but umpires Richard Kettleborough and Michael Gough decided that the light was too poor. It was frustrating for a crowd of around 2,500, who braved the elements in the hope of seeing the sort of entertaining cricket they certainly witnessed.